What Is a Manifold Gauge Used For? Would you like to know more about how you can improve your air conditioning system? If you have answered yes to either of these questions, perhaps it is time you looked into air conditioning manifold gauges. Whether you are trying to get some HVAC work done for your home or looking to work with HVAC technicians, having some basic knowledge about gauges is bound to come in handy. 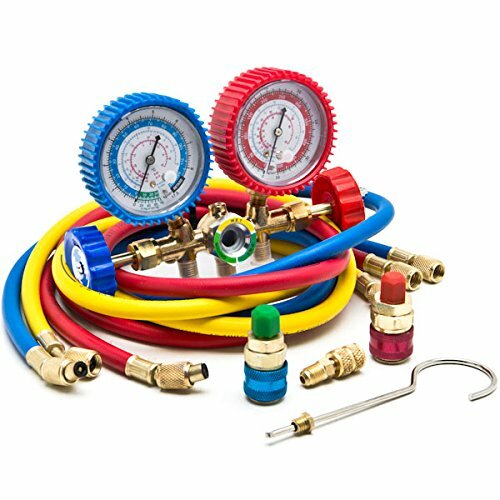 We’ve compiled a list of things you should know about air conditioning manifold gauges and a list of products we recommend, so scroll down for more information on air conditioning manifold gauges. 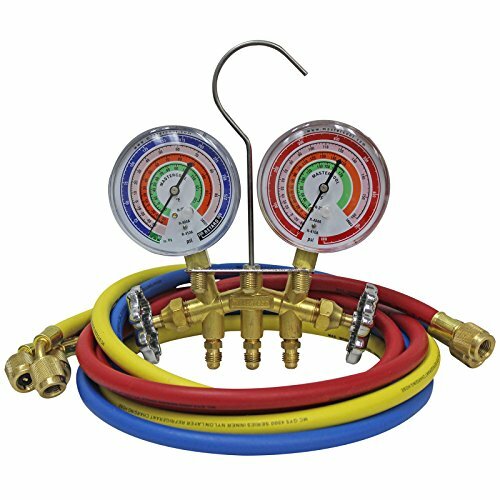 The manifold gauge is a must-have for someone looking to work on their HVAC system, as it is the most basic of all air conditioning systems. An air conditioning manifold gauge can be used as a diagnostic tool to check pressure and determine if there is a leak. It can also be used as a service tool to perform recharge and evacuation. There are two different types of air conditioning manifold gauge - analog and digital - but they are all built on the same principal. They are used to remove contaminated refrigerant to decrease the rates of cross-contamination, or to recharge your air conditioning system to keep your system working. Digital manifold gauges have been around for some time and their popularity has been on the rise recently, as they are capable of providing fast and accurate readings. There is much debate going on in the HVAC community about using digital manifold gauges, so we researched the pros and cons of digital manifold gauges vs. analog manifold gauges. First, the pros of analog manifold gauges are that they have been used for generations, and are a tried and true method. Seasoned technicians are able to read this type of gauge easily without even referring to a chart. The cons of analogue manifold gauges are that they can be difficult to read, and technicians are more likely to misinterpret this gauge, as it is more prone to conversion errors. 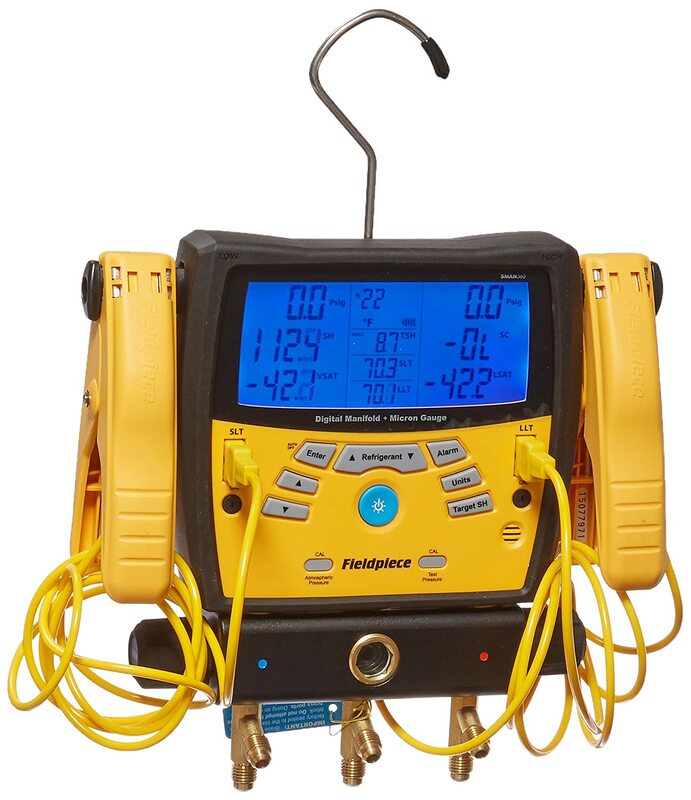 The pros of digital manifold gauges are that they are really easy to read and require no conversion table, as they come equipped with P/T charts and thermometers. Digital manifold gauges are also very accurate. The cons of digital manifold gauges include the upfront cost, as they are more expensive than their analogue counterparts, but it may be worth it in the long run and for their convenience. They are also less durable and heavier, and may require extensive training for HVAC technicians not used to digital manifold gauges. Digital manifold gauges are also not immune to computing failure in the system, and albeit rare, this could lead to a misreading. Keep reading below to find more info about each of the gauges mentioned above. 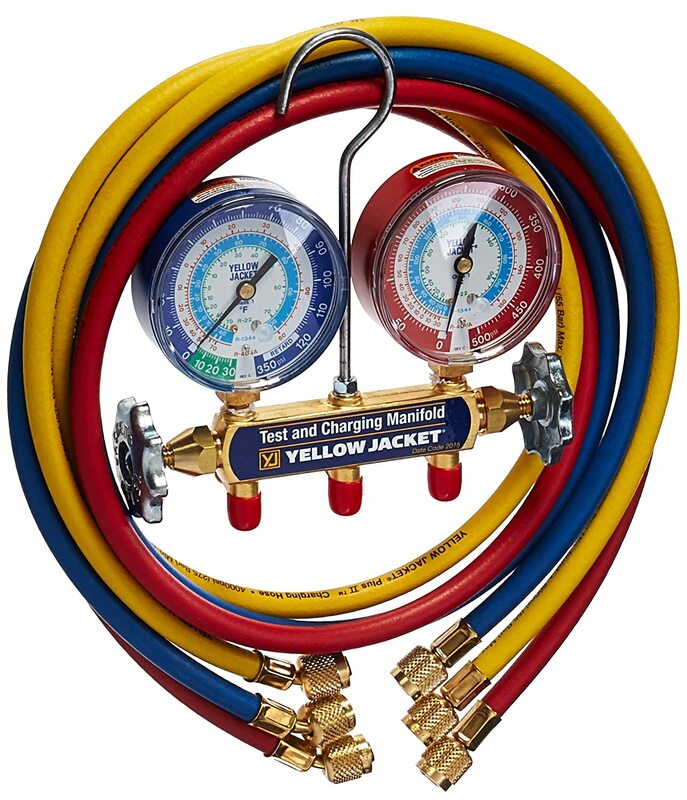 Is there really a “best” model when it comes to air conditioning manifold gauges? We’ve looked into many different models and picked a few to compare and contrast based on user reviews, but the decision is yours. While this model may not be the cheapest air conditioning manifold gauge out there, it is known for its user friendliness. This gauge features a solid aluminum body for ruggedness, large and accurate gauges that are easy to read, and extra long hoses for easy connection. Many users have raved about this model’s ability to connect quickly, preventing refrigerant leaks. However, there are some reported incidents of people receiving defective models. 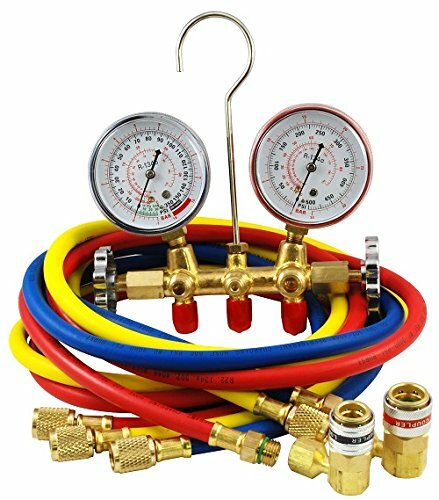 This manifold gauge is designed to be used with brass manifold body, and comes with automatic style couplers and 60” yellow, blue, and red hoses. The fully automatic couplers enhance convenience, and many first-time users have been satisfied with this gauge. There have been some reports of refrigerant leaks and dependability of readings, but overall it seems to be reliable and respected tool. This gauge is also available in larger, easier to read 3-1/8" color-coded gauges, and feature 1% accuracy for exact reading in critical charge systems and a brass body for durability. The high overall quality and accuracy make this a contender to consider. However, keep in mind that you need to get quick connects if you are planning on using this on an automobile. 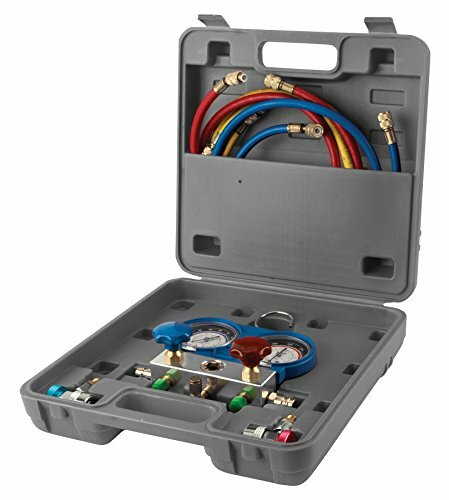 This manifold gauge set features quick couplers and an additional access port. This model is only for R134a, and if your automobile was manufactured before 1993, you will need to get a gauge for R12. 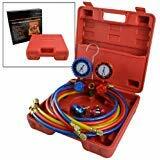 Users have reported this manifold gauge as a great product for the price and a good gauge for occasional usage. On the other hand, there have been complaints about mediocre build quality and dependability of readings. 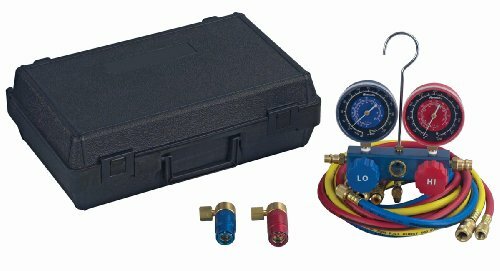 This gauge kit features 50’’ long hose and brass fittings. The users’ reviews for this gauge are a mixed bag. The overall consensus is that the gauge works like it is supposed to, but on the other end, people are experiencing lack of durability and build quality. 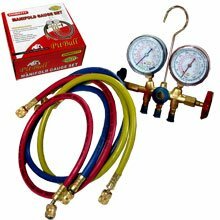 This manifold gauge set comes with 3 1/8" Gauges, 3-60" Hoses and Standard 1/4" Fittings. User satisfaction rate is high, and customers praised this gauge on its easily comprehendible gauge face and steady needles. Many users said this gauge was a good value for its price point. On the other end, some users reported having a difficult time controlling pressure with this gauge set. This manifold gauge set features quick connect fittings and color coded gauges, valves, and hoses. Users have claimed this manifold gauge set to be a good value gauge set that is highly functional for its low price point, and many have recommended this gauge set for occasional use. Yet other users proposed issues such as the gauge face being difficult to read, as it only features Celsius and not Fahrenheit, as well as cheap build quality and the set’s longevity. Users have recommended this gauge set for the home mechanic, as this gauge set does not come with instructions and may be harder for first timers to use. Users reported this gauge to be of fine quality, but not of a professional quality, and recommended it for occasional use. This gauge set also does not come with an adapter, so if you’re thinking of getting this gauge set, you might want to get a separate adapter. This digital manifold gauge features automatic calculation of target superheat, built-in micron gauge that allows you to set a micron alarm to a chosen micron level, stopwatch, and a rate indicator. 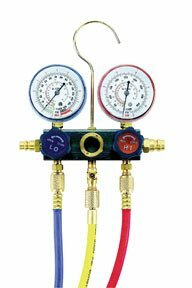 Users said this gauge is easy to use, as its digital nature makes using this device more intuitive, and especially recommend using this manifold gauge with superheat. On the flipside, users have reported issues with durability and ruggedness. 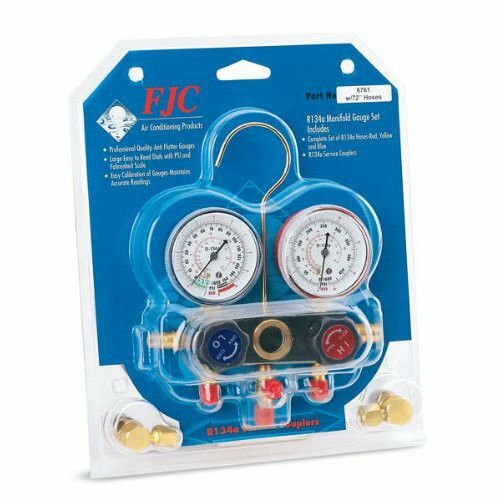 This manifold gauge kit features high rate charging and quick couplers. Users recommend this device for novice technicians for its versatility and workability. According to users, this device is fine for its price point, but it’s prone to rust and some users have pointed out its mediocre build quality as well as longevity as this manifold gauge kit’s flaw. There are many factors to consider when getting a new air conditioning manifold gauge, as it plays a pivotal role in diagnosing and fixing air conditioning systems. This article compared and contrasted the pros and cons of digital and analog gauges and compiled a list of manifold gauge sets you may be interested in looking to streamline the decision process, but it is up to you to make the decision and find the gauge set you really like. We sincerely hope this article was helpful in assisting you in the process.